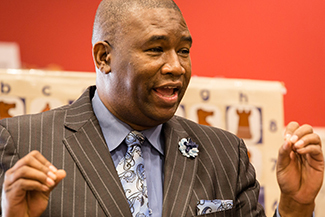 Orrin speaks at events and schools throughout the U.S., speaking to kids, parents, teachers, corporate management and staff about his mission of empowering kids to Be Someone. Stay up-to-date on Be Someone events and opportunities. Join our email list so that you can be the first to know what’s new with Be Someone! Orrin’s high-energy, short-duration presentations provide a series of meaningful steps students can use to stay on track in today’s fast-paced environment. © 2014-2016 • Orrin Hudson, Be Someone, Inc. is a 501 (c) (3) nonprofit organization using the game of chess to promote self-esteem, responsibility, and analytical thinking among at-risk kids.